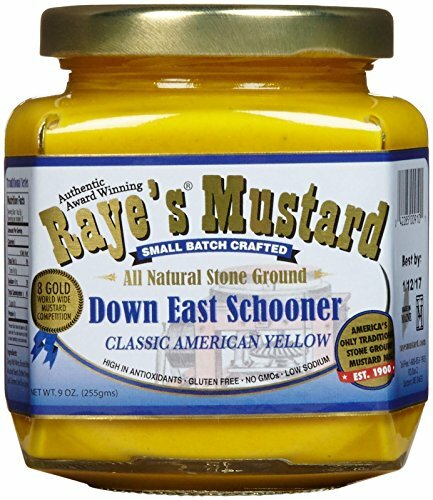 Raye's Mustard has been grinding this popular yellow mustard flavor since 1900. It has a full-bodied depth of flavor that is unusual in American style mustard. Down East Schooner once again won the 2006 Napa Valley World-Wide Mustard Competition's Gold Medal as the world's best classic yellow mustard!. Located in Eastport, Maine the USAs eastern-most city Rayes Mustard Mill is North Americas last remaining traditional stone-ground mustard mill. Four generations of the Raye family have been grinding mustard on the rock-bound coast of Maine since 1900, when 20-year old J. Wesley Raye, the son of a sea captain, founded the business in the family smokehouse to produce mustard for Maines burgeoning sardine industry. In 1903, Wes moved the mill to its current location, allowing Rayes Mustard to be shipped out by both rail and by steamship. Today, the trains, steamships and all but one of Maines sardine canneries are only a memory. But Rayes historic old stone mill, now a working museum, stands as a lasting testament to the quality and authenticity of a bygone era.